Top Left to Right: Dolce and Gabbana Men's Spring 2014 lace-ups, Dior Homme, and Prada sneakers. Lately, it seems we've been focusing a great amount of time on women's fashion instead of menswear also. There are other sites who are still talking about the must have women's accessories for next spring 2014, but not much (only a few) have shared their thoughts on next season's spring 2014 men's accessories. We have already covered most of the men's spring 2014 collection here - and probably have forgotten about them - but we haven't focused on something else that gives a final touch and life to an outfit.......Shoes! They are the basis of what makes a collection stand out even if "shoes" don't come to mind. Why do I like that outfit so much? The shoes are probably the answer. Personally, as I searched for some of the best shoes of the season, I noticed designers are beginning to put much more thought and details into men's shoes. We used to see the same types of brogues, monks, and oxford styles in past collections, but with technology changing the world of fashion, there is so much more to offer now. And bigger competition to survive in the accessories industry to convince someone to pay such thousands of dollars on a single pair of shoes. Real leather may increase prices over the sky for some, but you have to agree some things just transmit a better image when luxury is injected into them. All of these shoes above and below are basically the same type of leather until details become the noteworthy part that separate each brand. Dior Homme caused a sensation with those insets of silver hardware that said nothing so basic about a pair of derbies, while Louis Vuitton's textured patches of silver-y metallic oxfords stated luxury party boy when paired with black suit attires - it made one want to leave those ordinary black oxfords somewhere else. Raf Simons (slide 19) also made squared loafers give us another thought on wearing them again with a technical brush of faded blue on its vamp, and Lanvin gave great amount of texture to its pair of white invigorating loafers (slide 13). When it came to casual attire, sneakers sure did make a pleasing l'air to spend some money on this spring. Fendi (slide 5) came up with one of the best men's sneakers to crave over with dying techniques that brought a super cool factor of an ordinary sneaker. Kris Van Assche (slide 18) didn't stay behind as well, giving black monk-straps a unique twist by turning them into a pair of black sneakers. Burberry Prorsum's men's colored sneakers in suede and Gucci's blue leather lace-ups gave them a nice classical touch for the ones who may have the money to spare on. But Valentino kept it strong again with their detailed camouflage sneakers that at $795 for a single pair of these describes what luxury sneakers are all about. 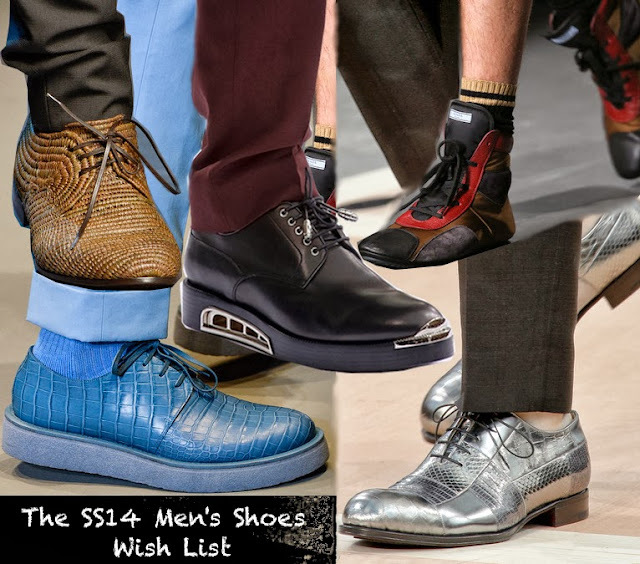 Although, Jimmy Choo's spring 2014 mens pair of sneakers and high-tops came much more aggressive in competition. But don't worry, because hopefully Kenneth Cole's new black and bronze snake high-tops (slide 10) may come accessible for the rest of us to enjoy. Overall, spring seems to come with indecisive choices of great men's clothes and shoes you'll have to think about to save you out of debt. And don't forget the soon to be here fall ones too. Which pair of shoes would you invest on next season? Click on the arrow buttons to see some more shoes.